Honesty, emotion and vulnerability pay tribute to the life of Mary Brown, through her daughter’s eyes, and allows this unique Irish family to heal. This is Mary Brown, written and performed by Winsome Brown, is a riveting and emotional tribute to Brown’s mother. Under Brad Rouse’s direction, This is Mary Brown, takes the opportunity to honor the truth and authenticity of this delicate relationship – involving Brown and her siblings having to deal with their mother’s struggle with alcoholism, lung cancer and overall fighting to keep the family together. 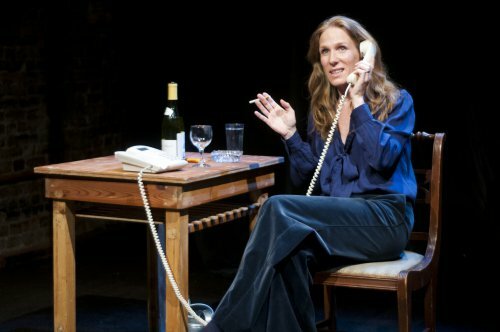 Brown portrays a myriad of characters including her father, siblings, mother, and other family members seamlessly – giving the audience a taste of what the family dynamic was like. She recounts the joyful moments such as her parents meeting and falling in love as well as the sorrowful ones – the children discovering their mother’s drinking problem and then deciding how to share the responsibility when it came to an intervention. There is no doubt that this Irish family has personality – but the realness and strength emerges from the ashes. Brown honestly and respectfully tells this story, and uses the dark periods and painful moments to heal. She balances out the tough times with flashes of light and uses her beautiful singing voice and guitar to express herself when words can no longer serve. Lighting design by Michael O’ Connor adds to the overall mood and adjusts to Brown’s scene changes as she dives into the story book of her family from childhood up until her mother’s final days in the hospital. The lighting emphasizes the simple setting she grew up in and the contrasting “brightness” and “dimming” mirrors the emotions to a tee. While the audience is privileged to take this journey with Brown, it is a blessing to see her character develop and triumph through it all. Being able to share such a personal story is admirable and being able to witness her fulfillment at the end is a gift. A well-mounted jukebox musical based on the 1999 teen drama. It’s best appreciated by those of the right age nostalgic for the music of their youth. A fascinating, but talky game of emotional one-upmanship. The secret to the show's success lies in its variety, both musical and theatrical. A first-rate cast directed and choreographed by Denis Jones. Old secrets are revealed and the immigrant experience is detailed in this engaging show when a young Jewish man writes a book about his family’s history. This stilted small-scale presentation of the adaptation of the Greek tragedy “Antigone” by Irish Nobel Prize laureate Seamus Heaney fitfully succeeds.